When I was in graduate school I picked up the book Silent Spring by Rachael Carson. It was my first exposure to a woman who woke up many people in 1962 to the painful truth that we were poisoning our waters with agricultural pesticides and herbicides. She helped many Americans understand that as a result of poisoning our ecosystems and waterways, we were poisoning ourselves. Her book is why we have the Environmental Protection Agency branch of our government, no matter how crippled by corporate interests it has been. With continual shock and alarm, reading Silent Spring opened my eyes to what we have done and continue to do to our waters. Poisons we have released onto the earth are leaving massive bodies of water (including ground water) all over the world unsuitable for drinking, bathing, or for aquatic life. Many of us are still waking up to the truths of agricultural chemicals polluting our water, as well as the poisons released in fracking, pipelines, and residential chemical use. As many of us know, it is often the most marginalized and oppressed people of the world (as well as vulnerable plants and animals) who are most affected by this. I grieved and grieved… and prayed and prayed. And I began to listen to the voices of the waters. I listened to the spirits of the rivers, who had been calling me for years. I listening to the spirits in the rain and the ground water. I listened to the voices of the seals, the fish, the turtles, the whales, the crabs, the minnows, the herons, the beavers, the salamanders, and the salmon. I listened to the voices of the seaweeds, the cattails, the water lilies, and all the beloved plants who grow by the shores… Sweet blue vervain. Joe pye weed whispering to me since I was a child. Linden reaching to me across the water in my boat. I listened to them speak, and asked how we might be able to help heal and protect this sacred life source we all depend on. Right now people all over the world are listening to voices coming from the oceans, rivers, lakes, and springs that give us life. This life giving water feeding billions of people around the world (and trillions of plants and animals) is crying out to us. We know we have been poisoning our water for over a century as population and industry have exploded. The plants and the animals of the waters are also speaking to us, if we take the time to listen to them. Our ancestors, and indigenous people all over the world are raising their voices, and fighting for the protection and healing of these precious waters. As Indigenous Americans fight and pray to protect the sacred waters of the Missouri river and their holy grounds, they are calling out to ALL of us to wake up to what we can do. We must start listening to the voices of those we have silenced. Those who have always been speaking for the wellbeing of life on earth. It is time to help these voices rise up. It is time to wake up others to what we have done and continue to do to the earth and to the indigenous people of this land as we spread our poisons. It’s time we stop pouring chemicals down our drains, into our sacred waters… Cleaning products and body care products filled with poisons. Herbicides and pesticides on our lawns. Electric companies spraying chemicals along roads to kill plants, chemicals that get into our ground water and do not break down. It’s time we help each other take responsibility in our own lives to keep our waters clean. Listening to the voices of the waters led me to rivers and waters all over the world, in body and in the dreamtime. I journeyed to the rivers and streams of the West Coast, to the voices of the Pacific ocean calling us to listen. I spoke with the spirits of the Atlantic ocean in Maine and along the Cape… traveling through the ocean’s past and present. I journeyed in Hawaii and listened to the voices of the land and sea. I listened to the water and land protectors there, the voices of the native people who continue to have their sacred homelands stolen. I stood in the rivers and the waves, and listened. I let them carry me through time. I journeyed to the Guadaloupe River, the Colorodo River, the Danube in Europe, the Amazon River, the Shannon river in Ireland, and the Connecticut river of my home. I stared into wells and listened. I came when they called. Danu, the goddess of the rivers, kept speaking in my dreams. I prayed with my ancestors, and I listened for what I could do. I spoke with the salmon in Ireland, the seals on the Cape, and the salamanders in Vermont. I prayed at the holy wells, now polluted from fracking. I allow the waters and the poisons to teach me. Praying for guidance into compassionate action and relationship. 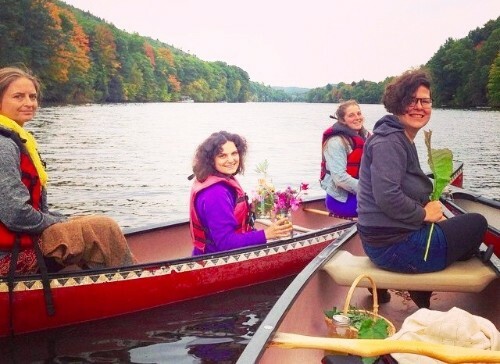 In September we rowed our canoes out into the middle of the Connecticut river, bringing flowers, crystals, blessings herbs, drums, and our prayers. A group of my students and I had been creating rituals to help heal our waters, and we wanted to start at the beautiful river closest to us. As we sent our prayers into the sacred waters of our New England home, we also sent healing to the waters all over the earth. We sent healing energy and our love into the river, offering flowers, sacred herbs, and songs. This is a time to give our love and prayers to the waters. Native Americans have lived and traded along the Connecticut river for thousands of years. It is New England’s longest river at 410 miles long. It begins at the northern tip of New Hampshire as a small pond surrounded by spruce and fir trees along the Quebec border, and stretches all the way to the beaches and marshes of Long Island Sound. There has been a long history of cleaning the Connecticut river since the industrial revolution, though there continues to be contamination. In 2010 the nuclear power plant, Vermont Yankee, in Brattleboro, VT leaked tritium and other chemicals into the Connecticut river. As a result the plant was shut down in 2014. We prayed for the healing of this sacred river, and for the healing of all waters. We offered our love, our gratitude, our apology, and our promises of action. In Ireland this past fall I visited holy wells, sacred to pagans for thousands of years, and later to the Christians. These sacred wells were created over springs that continually fed clean water, and were considered to be sites of deep spiritual and physical healing. I drank the waters, though people now say they are polluted by fracking chemicals. I prayed. I followed their streams and rivers and ate the watercress along them. I listened to the spirits speaking through the water. Get to know your local rivers and springs. Build an altar around your well. Pray at your water source. Bring a group to a polluted body of water near you, and send your prayers, healing energy, and love into it. Offer it flowers of gratitude, sacred smoke, and songs. Send healing music into its depths. Let the spirits speak to you from within the waters. They are waiting for us to listen. It is time we heal them together. Prepare a bowl of clean water or stand beside a body of water. ~ Please pray for the water in apology, for polluting and disrespect. Then offer prayers of love, gratitude and respect. ~ Please intend that the vibrations, which now fill the water will spread to the waters all over our Mother Earth. ~You may also add your own prayer to the water, meditation, chanting, music, songs, dancing, and so on intending the same purpose. ~ Pour a little bit of the water on their hand, with a loving thought, sprinkle the water away from you (as in spreading Seeds), then drink the water, with a feeling of gratitude.